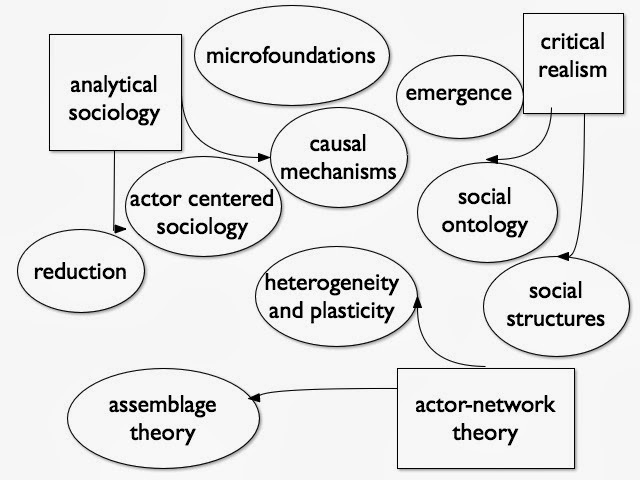 In each of these areas there are well defined debates underway, and in some cases there are interesting cross-references across these areas of theorizing. If we were drawing a graph of these debates, we might consider several major poles — analytical sociology, critical realism, and ANT — and arrange the other topics according to their interconnectedness with the claims of one or the other of these poles. The main point is that theory and theorizing is just not a single thing. Yet, the problem is that this is not just a definitional or “lexicographic” issue, or even an issue of the fundamental polysemy of all meanings; it is a reality, an objective fact that there are multiple modes of doing theory and that these modes entail a different set of initial dispositions, a different history of acquisition, and ultimately the mastery of distinct (and possibly conflicting) sets of skills. I think that the proper metaphor is that there exist different “genres” of theory, and that we can all become proficient (realistically) in one, two, or at most three of these genres. As theory becomes devalued, and the field becomes increasingly heteronomous, the basic danger is to rush into thinking that our salvation entails the privileging of any one of these genres (e.g. the one preferred by so-called “Analytical Sociologists”) to the denigration of all others (e.g. theory in the classical mode, or theory in the meta-methodological mode). This (essentially retrogressive) temptation must be fought at all costs. I think mapping in Little’s sense can be an important antidote to this tendency. It can help us get a sense of the theoretical landscape as a whole, encouraging debate about the key issues and how different approaches relate to them. I don’t think it can ‘fix’ theoretical fragmentation but I think it can ameliorate some of the negative tendencies which flow from it.